Is it just us, or does it feel like this winter has been particularly cold–not just in temperature, but also in spirit? Between the current political climate and the amount of vitriol easily accessible on social media and beyond, it feels like we all need a huge hug, right? (We can actually hear Dionne Warwick in our heads right now singing "What the World Needs Now is Love.") It's a good thing Valentine's Day is on it's way with all types of love vibes. While it was once a day embraced by couples and dreaded by singles, V-day has become much more than an excuse for chocolates and cheesy gestures lately (hello, galentines and self love sessions). With that in mind, we've created a guide to shoes for those who would rather wear their hearts on their feet than their sleeves. Some of them even cost less than $100! Whether your February 14th will be a sultry V-day, a supportive we-day or a sweet me-day, we've got you covered. You know we're loving the new white-shoes-whenever rule in fashion. 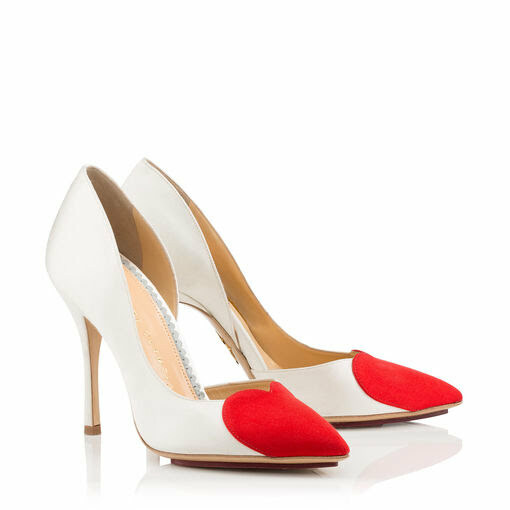 So how could we not be smitten with these Bethany pumps by Charlotte Olympia with their red heart-accented toes? With a simple half-D'orsay silhouette and slender stiletto heels, these shoes more versatile than you think. Try them with a simple, but slinky black midi dress or add edge with jeans, a tee and a biker jacket. Available for $690 HERE. Raise your hand if you loved those Saint Laurent pumps with heels sculpted into brand's iconic logo. Aldo's Cupidd pump gives us a similar vibe, but doesn't give us the same level of financial angst. Heading out for a wild girl's night? 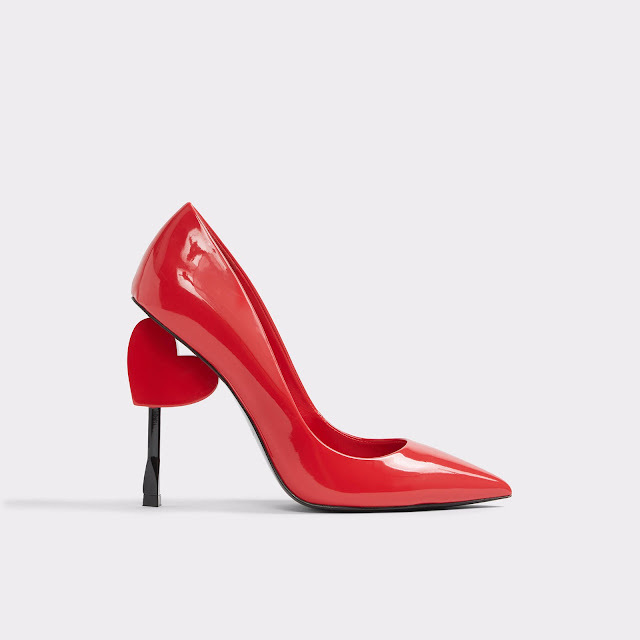 This fierce red shoe is for you... Seriously, you're literally walking on hearts in this pump. Imagine the witty banter this heel will inspire. Available for $100 at Aldo. Meeting your crew for an insta-worthy night of dinner and drinks (#sqadgoals)? 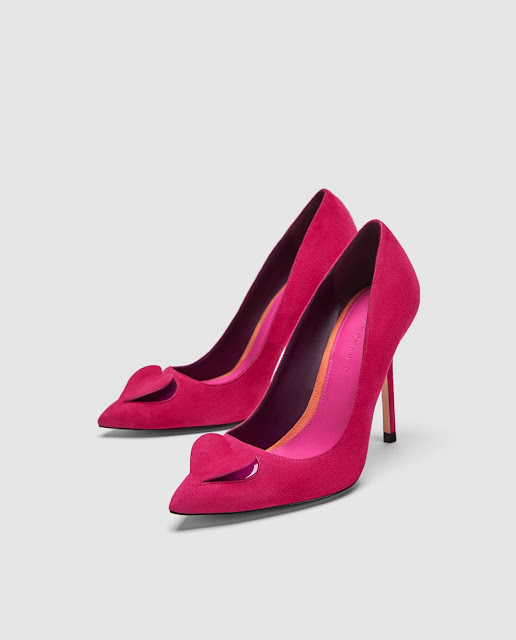 The these fuschia pumps from ZARA will garner plenty of likes with their pop-up hearts. (We see cute shoe and drink pairing pictures in your near future.) They'll look lovely with a flowy dress and add a sweet kick to a pair of camouflage jeans. Available for $79.90 at ZARA. 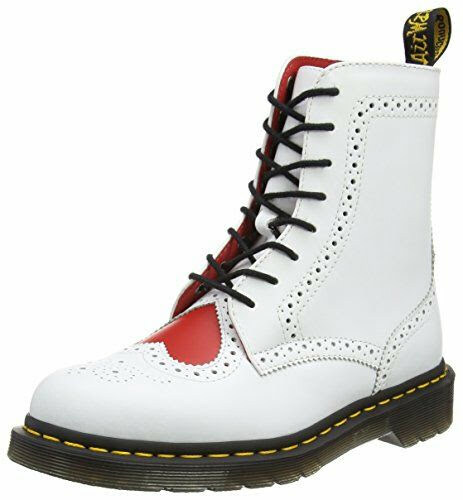 If your plans include a romantic dinner at a fancy restaurant with "bae", you may want a shoe that's a little more subdued (but still has a whimsical touch). Enter, Kate Spade's Olidah sandal. Its classic ankle-strap silhouette in supple black suede give it a demure feel. The shimmering heart at the back of the ankle say you have a playful (maybe even a bit mischievous) side. Available for $228 at Kate Spade. Lucky enough to live in warmer climes (or bold enough to rock the socks and sandals trend)? Katy Perry Collections' Hug-and-kiss-themed "The Rosemarie" sandals are for you. The blush (or millennial pink if you're into that thing) tone is full-on feminine, and the red X and O sculpted heels add a fun edge. Available for $149 at here. Perhaps you're in a playful mood. 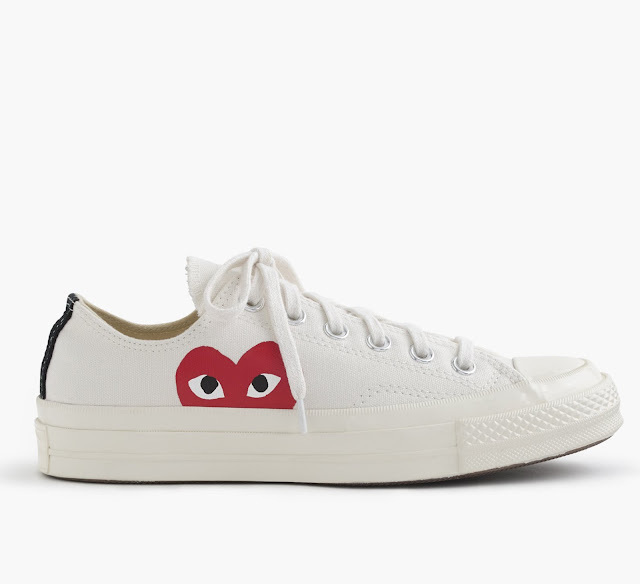 Well, this Comme des Garcons Play X Converse low-top All Star is for you. Perfect for a picnic in the park, or simply showing your inner child some love, these sweet sneakers are part of Jcrew's special Valentine's Day shop. Get them here for $125. Love reigns supreme, right? 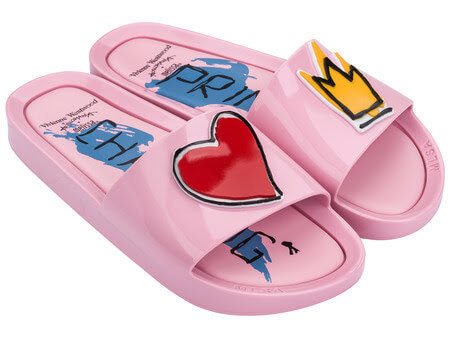 If you agree, you'll surely get a kick out of these pool slides from Vivienne Westwood Anglomania and Melissa. The heart, the crown, the fact that they actually say "Prince Charming" on the insole (though we know he's not a must, right?)... they're, well, charming. Available at ShopMelissa.com for $120. Remember, we love you with all our hearts (and soles)!